A confession led to an abduction this week on Pretty Little Liars. Where is Dr. Sullivan? Is that the main question you have heading into next week's midseason finale? Such topics are on the mind of TV Fanatic Editor-in-Chief Matt Richenthal, along with staff writers Carissa Pavlica and Teresa Lopez. 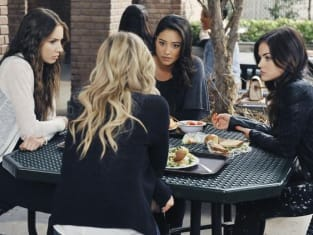 Won't you come along as they analyze "I Must Confess" via the latest edition of the Pretty Little Liars Round Table? Matt: NOT seeing Ezra on my TV screen. Does that count? Nothing against the character, but that whole storyline is played out: Will he go public with Aria? Yes? No? Just decide already, please. Carissa: The girls telling Dr. Sullivan about A. FINALLY an adult knows. It obviously doesn't bode well for the good doctor, but at least they tried. Second favorite scene was Aria and Mike coming clean about his shenanigans. They are less like liars now. Teresa: Hanna's grandmother grossing out the girls was so funny. Her crass comments and I-don't-give-a-crap attitude is just perfect for a show that sometimes takes itself a little too seriously. Were you happy to see Maya again? Matt: No. She doesn't seem like a real human being. She's always smiling, and saying cheesy things, and she started hitting on Emily right away back on season one. The character just comes across as some kind of lesbian-related plot device. Carissa: Surprisingly, yes. I found her a bit annoying the first go around, but she seems to have grown as much as Emily since they were last together. I hope they find happiness. Teresa: Yes and no. I thought it was good for Emily to get some closure on that relationship, but I don't really want to see these two couple up again. They were kind of annoying and overly mushy. What secret is Spencer's father hiding? Matt: He's Jason's father. No doubt. Book it. Credit me later. Carissa: I'm guessing Spencer's father is hiding a bushel full of secrets. The tip of the iceberg is that he changed the date on the will. The real intel will start falling out of the basket when A decides to focus on Spencer instead of Emily. Secrets about the DiLaurentis family should be good ones! Teresa: A whole bunch of illegal activity? Actually, I hope its that Spencer actually killed Allison, but had some kind of psychotic crack up and doesn't remember it. Jason knows and exchanged his silence for the change to Grandma's will. Too crazy? Kate's plan for vengeance: So cruel, or so lame? Matt: Beyond lame. It relied far too much on factors outside of her control: What if Hanna didn't like vodka? What if she could hold her liquor? What if she had a big meal beforehand? What if she simply threw up in the toilet? Calling Blair Waldorf! Someone needs help scheming! Carissa: Cruel and lame... would have been more cruel if we hadn't met Hanna's awesome grandmother. I really hope she sticks around. Surely, she can see how much Hanna needs her. Lame because the idiot was "babysitting" the dress and somehow thought it being ruined was Hanna's fault? But she wasn't the one babysitting it! Teresa: It was kind of lame since it really relied on Hanna being dumb enough to drink herself stupid at such a formal event... and then dance around drunkenly with the dress... and then miss the sink, toilet, and/or floor to vomit directly on the dress. I take it back. Hanna was the lame one for falling for this complex revenge plot. What is the one question you hope gets answered on the midseason finale? Matt: What is Byron's middle name? Also: is Spencer's dad Jason's father? Just so I can be proven right. Carissa: Who "A" is. It's time to find out and then move on to who was behind it. Because you know that part of the story will be an entire arc of its own.